Cook the yellow cake according to package directions and let cool. Poke holes in the cake in uniform lines. Be sure to let hole go all the way down to the bottom of the cake pan. 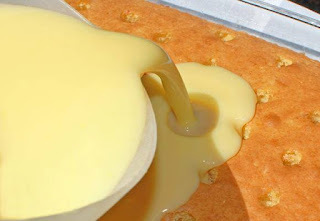 Prepare pudding according to package instructions; let sit for 2 minutes and then pour on top of cake. Let pudding set, about 5-10 minutes. Spread whipped topping on top of pudding. Add crushed cheerios. You can serve immediately or let the cake sit over night to set further.